It’s no secret: kids can make it incredibly hard for adults to say “no,” whether your young child is having tantrums and acting out—or your teen has escalated to becoming verbally (or physically) abusive. Your child might also try to make you feel guilty in order to get his way, or act overly sweet and responsible, only to revert to his normal self after the “prize” has been won. Remember: your job is to set the limit, not to control how your child feels about it or reacts to it. This behavior usually starts when kids are young. Maybe your daughter acted out in the grocery store when she didn’t get something she wanted. You tried to be firm but finally let her have the coveted candy or toy she was screaming for so she would just be quiet and stop embarrassing you. Or maybe you were at home one day and you told your son to turn off the TV. Perhaps he cried, put on his best sad face, and said, “Please mommy—just 10 more minutes?” The ten minutes turned into another ten minutes and then an hour, until you found yourself feeling frustrated and angry that you didn’t stick to your limits. The bottom line is that we all know what we should do in these situations but let’s face it—it can be really hard. Over time, parents can get stuck in a pattern of giving in even though they want to set firm limits. But it’s never too late to start taking back your authority so you can help your child develop the skills he’ll need to cope when people tell him “no” in the adult world. Why is Setting Limits So Hard? Most parents want their kids to be happy. Most of the time, when your kids are happy, you’re happy. The opposite is also true—it’s so difficult to see your child hurting, because it hurts you too. 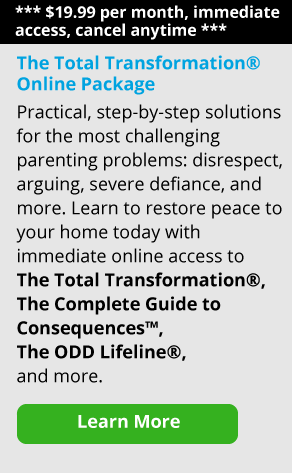 For many parents, it’s easier to give in than to deal with their child’s negative reaction or their own feelings of guilt, resentment, anger, or general discomfort. Other parents give in by doing their child’s chores for them without holding them accountable because they don’t feel like fighting about it. So basically, parents can become too focused on their short-term goals: to get some peace and quiet or to feel better emotionally. If this is you, it’s time to shift your focus to the bigger picture of consistent limit setting, as difficult as that may be. Parents also struggle to say “no” because of other people’s opinions or pressure from friends, family, or society in general. Parents often feel that they should do this, or they should allow that. I talk to parents on the Support Line all the time who doubt their decisions because their “child’s friends’ parents” seem to be doing things differently. Or, they received some criticism from someone they trust, such as their own parent or their best friend. So they compare themselves to others—or to an imagined ideal—and act how they think they should out of fear of being judged, rather than acting how they think is right for their family and their child. Here’s the truth: Nobody knows your values and your child better than you do, so try to remind yourself of that when you’re feeling that outside pressure to be a certain way. Keep your focus on the big picture and remember: no matter the reason, giving in is a “quick fix” that will almost guarantee problems later on. As James Lehman says, “Always ask yourself, ‘What’s the best thing to do for my child right now?’” Sometimes the answer is to set limits and give a consequence in order to teach them an important lesson about behavior. Many parents I’ve talked to dread saying “no” to their kids because of how their kids react: they might scream, cry, curse, use name-calling, throw things, damage the house, or hit. Some kids harass their parents by following them around, arguing and begging, which can be just as challenging. Parents often reach a point where they prefer to say “yes” because it’s not as hard to deal with. Some eventually give up hope that their child’s behavior can change, but it can. You can start to take back control by keeping your long-term goal in mind. Before you answer a request from your child ask yourself, “How do I want my child to be as they grow older? What do I want them to learn here?” Think about this before you respond. If your child continues to lash out at you, beg you, or badger you after you’ve told them “no,” it’s very important to set a clear, firm limit. Remember: your job is to set the limit, not to control how your child feels about it or reacts to it. So focus on what you can control—yourself and how you act. Tell your child their behavior isn’t going to get them what they want and walk away. After you’ve walked away, do something to take care of yourself, something that will help you deal with the stress or frustration you’re feeling. For example, you might call a friend, go for a walk (if your child is old enough to be left alone), or write in a journal. No matter how you cope, be sure to stick with the limit that you have set. There will be times that you make mistakes, but it’s important to be as consistent as you can. It’s the slot machine effect: you can follow through 99 times out of 100, but that one time you didn’t follow through and gave in will be what your child remembers, and he’ll keep coming back for more. “Positive self-talk” is also a really helpful tool. Say things to yourself like, “It’s okay if he’s angry now. This is what’s best to help him become a mature, responsible adult who can take directions from his employer,” or “It’s normal for my daughter to be angry with me at times. Being angry is the only way she can learn to deal with anger. It’s going to be okay once things calm down. We can get through this.” If you allow yourself to entertain negative thoughts about how difficult the situation is or what an awful failure of a parent you are, it will be much harder for you to follow through with the limit you have set. Rise above the urge to beat yourself up and put yourself down. Instead, focus on being strong and positive. While some kids can get pretty ugly when they’ve been told “no,” others can take it to the other extreme by acting too good to be true. I’ve heard many parents say, “She can be so sweet when she wants something.” If you have the type of child who suddenly starts scrubbing the toilet and making you breakfast after you’ve said no to them, don’t take the bait! Other kids will cry and sob and thrust that “You don’t love me!” dagger directly into your heart. However your child tries to manipulate you, it’s important that you first recognize it for what it is. Acknowledge it, and then acknowledge your guilt. Yes, it’s horrible to feel guilty, but it’s not worth sacrificing your authority to ease your guilt. You are strong and you can cope if you just remind yourself that effective parents set appropriate limits, and that parents have to say “no”—it’s part of your job description. Use your positive self-talk here as well and stand your ground. If your child makes another request to which you have already said no, let them know you appreciate their help and (not “but”) it doesn’t change your answer. Over-negotiating is another trap parents often fall into. This is what happens when you say “no,” your child manipulates and “out-lawyers” you, and then you give in and tell them “yes.”The biggest problem with this is that it teaches your child that his manipulative or abusive behavior works. It feeds the behavior, so it continues and may even get worse. Aside from that, over-negotiating also teaches your child that boundaries and limits are not solid. 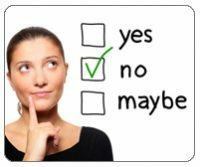 When you say “no,” it doesn’t really mean “no.” They will translate this to other parts of their life. Later, when the speed limit is 25 it won’t really mean 25. When their boss says the report is due on Friday, it won’t really mean on Friday. When you over-negotiate, you teach your child that with enough push-back or flattery, he can get what he wants. Additionally, your child learns that you don’t really mean what you say. And if you don’t mean what you say, then you are not going to be seen as much of an authority figure. That said, there are acceptable ways for kids to negotiate. What this looks like is that your child doesn’t jump right into any sort of abusive behavior. She might express some unhappiness about your answer, but not in a harmful way. When negotiation is healthy, your child will leave the situation, think things through, and then come back and calmly ask for a compromise. It should sound like a business transaction—no crying, no verbal abuse, no threats, no manipulation. For example, let’s say you’ve told your teen daughter she can’t stay out past a certain time after the homecoming dance. The next day, she comes back to you and says, “Hey, I’ve been thinking about my curfew after homecoming. What if I come home on time for the next two weeks? If I do that, then can I stay out later after the dance?” Another example is, “If I get all my homework done and make dinner tomorrow night, then can I go to the movies with my friend?” If your child has been appropriate between your “no” and her proposal, then it might be okay to consider her idea, especially if your child is agreeing to practice a behavior you want her to improve on. And keep in mind that “appropriate” doesn’t mean “perfect.” Suppose your son stomped to his room and slammed the door—which is a pretty harmless show of frustration—and then he conducts himself decently during his discussion with you later, when he requests a later bed time. Saying “yes” to a child who negotiates appropriately like this is an opportunity to reward positive behavior, to show your child that calm, respectful communication skills work and help him get what he wants. This is not always the case—there may be times where you still have to say “no” even if your child has negotiated appropriately because you just aren’t able to say “yes,” or when giving in will undermine an important goal you have for your child. For example, you can’t afford the fancy sneakers he wants, or you aren’t willing to budge on your expectation that he get a job during the school break to learn some responsibility. A word of caution: your child can be very calm and respectful, and make a completely appropriate-sounding request, but don’t fall into the trap of giving your child the payout before he’s earned it. I’ve talked to parents who fell right into the promise trap. Kids will often promise to change or promise to do something you want them to do only if you give them something they want first. This is not a compromise and it’s not a respectful, businesslike proposal. It’s manipulation, plain and simple. Don’t fall for it. Set one new limit. No parent gives up their authority intentionally and it certainly doesn’t happen overnight. It took time to get to this point, and so it’s going to take some time to get back to a point where you have a sense of authority once again. As tempting as it is to overhaul your entire parenting strategy and say “no” to everything, resist that urge and pick just one thing to start with. You’ll be most effective that way. For example, maybe your daughter wants to spend all weekend every weekend at her friend’s house and it’s a huge hassle, on top of which you never see her and she’s not home to get her chores done. You might start by letting her know that from now on she can only spend one night per weekend with her friend and she needs to be home by 3pm the next day. This is a single clear limit that you can remember and enforce consistently. If you have too many new limits, you might start to forget what they are and then consistency goes right out the window. Script it out. Once you decide what one thing you will start saying “no” to first, find a relatively calm time to present your plan to your child. Let your child know what is changing, including how you will respond to their acting out or manipulation. Communicate it to them in writing, an email, or a text message if they won’t talk in a half-decent way to you face-to-face. It’s helpful to acknowledge how frustrating this is going to be for your child and talk to your child about what they can do to cope with the anger they’re going to feel as part of this process. Take it slow. This one new rule is the first step to gaining back your authority. Continue to keep your long-term goal in mind when things get tough. Remember to walk away and take care of yourself when you’re having a hard time standing your ground. Take it slow, and when you feel like you’re succeeding with consistently enforcing your new rule, then you can add another new rule. I like to tell parents that this is a slow process, similar to putting together a large, complicated puzzle. You know what you want it to look like at the end, but you have to put the pieces together slowly, one by one. Day by day, piece by piece, you’re working toward that long-term goal: having a child who can cope with the limits you’ve set and hearing the word “no,” and who is able conduct himself well in the adult world because of all the hard work you did along the way.